Definition at line 47 of file CStochMethod.h. Definition at line 48 of file CStochMethod.cpp. Definition at line 55 of file CStochMethod.cpp. Definition at line 63 of file CStochMethod.cpp. Definition at line 237 of file CStochMethod.cpp. References C_FLOAT64, C_INT32, C_INT64, CModel::getReactions(), mAmu, mDoCorrection, mLocalSubstrates, mNumbers, and mpModel. Referenced by updatePropensities(), and updateSystemState(). Definition at line 42 of file CStochMethod.cpp. Definition at line 104 of file CStochMethod.cpp. Generate the index of a putative reaction. Definition at line 389 of file CStochMethod.cpp. References C_FLOAT64, CRandom::getRandomOO(), CModel::getReactions(), mA0, mAmu, mpModel, mpRandomGenerator, and CCopasiVector< T >::size(). Definition at line 408 of file CStochMethod.cpp. References C_FLOAT64, CRandom::getRandomOO(), mA0, and mpRandomGenerator. Referenced by CStochNextReactionMethod::setupPriorityQueue(), and CStochNextReactionMethod::updatePriorityQueue(). Definition at line 416 of file CStochMethod.cpp. Get the set of metabolites which change number when a given reaction is executed. reaction_index The index of the reaction being executed. Definition at line 560 of file CStochMethod.cpp. References CModelEntity::FIXED, CCopasiParameter::getKey(), CModel::getReactions(), mpModel, and CCopasiVector< T >::size(). Get the set of metabolites on which a given reaction depends. Definition at line 534 of file CStochMethod.cpp. References CModel::getReactions(), mpModel, CFunctionParameter::PARAMETER, and CCopasiVector< T >::size(). Definition at line 69 of file CStochMethod.cpp. References CCopasiParameterGroup::assertParameter(), CCopasiParameter::BOOL, C_INT32, CCopasiParameterGroup::getParameter(), CCopasiParameter::getValue(), CCopasiParameter::INT, CCopasiParameter::Value::pBOOL, CCopasiParameter::Value::pINT, CCopasiParameter::Value::pUINT, CCopasiParameterGroup::removeParameter(), CCopasiParameterGroup::setValue(), and CCopasiParameter::UINT. Referenced by CStochMethod(), and elevateChildren(). Definition at line 583 of file CStochMethod.cpp. References CCopasiMessage::ERROR, CModel::getCompartments(), CTrajectoryProblem::getDuration(), CModel::getEvents(), CModel::getMetabolites(), CCopasiProblem::getModel(), CModel::getModelValues(), CModel::getNumMetabs(), CModel::getNumModelValues(), CModel::getTotSteps(), CCopasiParameter::getValue(), CTrajectoryMethod::isValidProblem(), MCTrajectoryMethod, CModelEntity::ODE, CCopasiParameter::Value::pINT, CCopasiVector< T >::size(), and CModel::suitableForStochasticSimulation(). Definition at line 676 of file CStochMethod.cpp. Definition at line 424 of file CStochMethod.cpp. 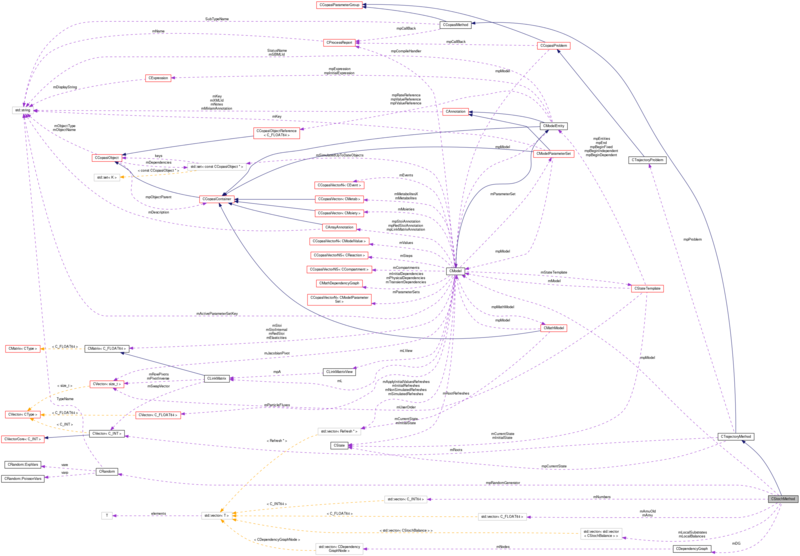 References CDependencyGraph::addDependent(), C_INT32, CDependencyGraph::clear(), CModelEntity::FIXED, getAffects(), getDependsOn(), CCopasiVector< T >::getIndex(), CModel::getMetabolitesX(), CModel::getReactions(), max, mDG, CStochBalance::mIndex, mLocalBalances, mLocalSubstrates, mMaxBalance, mMaxIntBeforeStep, mMaxSteps, CStochBalance::mMultiplicity, mNumReactions, mpModel, CDependencyGraph::resize(), and CCopasiVector< T >::size(). Definition at line 160 of file CStochMethod.cpp. References C_FLOAT64, C_INT32, C_INT64, CModel::deterministic, CStateTemplate::getIndex(), CModel::getMetabolitesX(), CCopasiProblem::getModel(), CModel::getModelType(), CModel::getReactions(), CModel::getStateTemplate(), CState::getTime(), CCopasiParameter::getValue(), CRandom::initialize(), initMethod(), mAmu, mAmuOld, mDoCorrection, mFirstMetabIndex, mHasAssignments, mMaxSteps, mMaxStepsReached, mNumbers, mNumReactions, modelHasAssignments(), CTrajectoryMethod::mpCurrentState, mpModel, CTrajectoryMethod::mpProblem, mpRandomGenerator, CCopasiParameter::Value::pBOOL, CCopasiParameter::Value::pINT, CCopasiParameter::Value::pUINT, setupDependencyGraphAndBalances(), CCopasiVector< T >::size(), updatePropensities(), and CModel::updateSimulatedValues(). Definition at line 110 of file CStochMethod.cpp. References CState::beginIndependent(), C_FLOAT64, doSingleStep(), CCopasiMessage::EXCEPTION, CModel::getMetabolitesX(), CCopasiProblem::getModel(), CModel::getNumVariableMetabs(), CModel::getState(), CState::getTime(), MCTrajectoryMethod, mFirstMetabIndex, mMaxIntBeforeStep, mMaxSteps, CTrajectoryMethod::mpCurrentState, CTrajectoryMethod::mpProblem, CTrajectoryMethod::NORMAL, and CState::setTime(). Definition at line 222 of file CStochMethod.cpp. References calculateAmu(), mA0, mAmu, mAmuOld, and mNumReactions. Referenced by start(), and updateSystemState(). Definition at line 317 of file CStochMethod.cpp. References CModelEntity::ASSIGNMENT, C_FLOAT64, C_INT64, calculateAmu(), CDependencyGraph::getDependents(), CModel::getMetabolitesX(), mA0, mAmu, mAmuOld, mDG, mHasAssignments, mLocalBalances, mNumbers, mpModel, CMetab::refreshConcentration(), CModel::setTime(), CModelEntity::setValue(), updatePropensities(), and CModel::updateSimulatedValues(). Definition at line 62 of file CStochMethod.h. Referenced by generateReactionIndex(), generateReactionTime(), updatePropensities(), and updateSystemState(). Definition at line 57 of file CStochMethod.h. Referenced by calculateAmu(), generateReactionIndex(), generateReactionTime(), start(), CStochNextReactionMethod::updatePriorityQueue(), updatePropensities(), and updateSystemState(). Definition at line 67 of file CStochMethod.h. Referenced by start(), CStochNextReactionMethod::updatePriorityQueue(), updatePropensities(), and updateSystemState(). Definition at line 252 of file CStochMethod.h. Referenced by setupDependencyGraphAndBalances(), CStochNextReactionMethod::updatePriorityQueue(), and updateSystemState(). Definition at line 72 of file CStochMethod.h. Definition at line 274 of file CStochMethod.h. Definition at line 79 of file CStochMethod.h. Referenced by start(), CStochNextReactionMethod::updatePriorityQueue(), and updateSystemState(). Definition at line 257 of file CStochMethod.h. Referenced by setupDependencyGraphAndBalances(), and updateSystemState(). Definition at line 262 of file CStochMethod.h. Referenced by calculateAmu(), and setupDependencyGraphAndBalances(). Definition at line 169 of file CStochMethod.h. Definition at line 174 of file CStochMethod.h. Referenced by setupDependencyGraphAndBalances(), and step(). Definition at line 164 of file CStochMethod.h. Referenced by setupDependencyGraphAndBalances(), start(), and step(). Definition at line 176 of file CStochMethod.h. Definition at line 267 of file CStochMethod.h. Referenced by calculateAmu(), start(), and updateSystemState(). Definition at line 269 of file CStochMethod.h. Referenced by setupDependencyGraphAndBalances(), start(), CStochNextReactionMethod::updatePriorityQueue(), and updatePropensities(). Definition at line 246 of file CStochMethod.h. Referenced by calculateAmu(), generateReactionIndex(), getAffects(), getDependsOn(), setupDependencyGraphAndBalances(), CStochNextReactionMethod::setupPriorityQueue(), start(), and updateSystemState(). Definition at line 241 of file CStochMethod.h. Referenced by CStochMethod(), generateReactionIndex(), generateReactionTime(), start(), and ~CStochMethod().